We were interested to note having read the results of a Personal Injury Compensation related survey by YouGov, that the up take by people eligible to pursue Personal Injury claims is low. Indeed, the survey indicated that only 1 in 5 (20%) of eligible claimants pursue their claims. This statistic, it would seem, provides concrete proof that the compensation culture doesn’t actually exist. I’ve argued for years that it is a myth and that it is something that insurers will find easy to get the public to believe. Let’s face it, if your insurers hike up your premium, you moan about it. When they blame the hiked premium on the compensation industry and the ever increasing army of claimants, you’ll believe them. We all need someone to blame, so let’s concentrate our ire on an easy target – the No Win No Fee claims industry. There are some interesting stats on the survey – see the earlier link – but most of the problems mentioned, particularly in terms of marketing and unsolicited texts etc, lies with the practices of the marketing industry and data providing companies, rather than with the greed or otherwise of claims management firms and Solicitors. The insurance sector has long argued that the prevalent advertising of the claimant sector (Solicitors and Claims Management Firms) has lead to a rise in claims and that they have therefore had to raise premiums to cover this. However, it seems that this survey flies in the face of that as only 5% of adults that have received a text, seen an advert or received a letter have gone on to make a claim. The insurance sector continue to make good profits and charge high premiums. If Personal Injury were to be outlawed from midnight tonight, we don’t doubt that the insurers would make even bigger profits – we also don’t doubt that they would continue to charge high premiums. From where we sit, it seems that the claimant is lambasted by insurers for claiming because of their own greed and because the ‘compensation culture’ encourages them to claim. 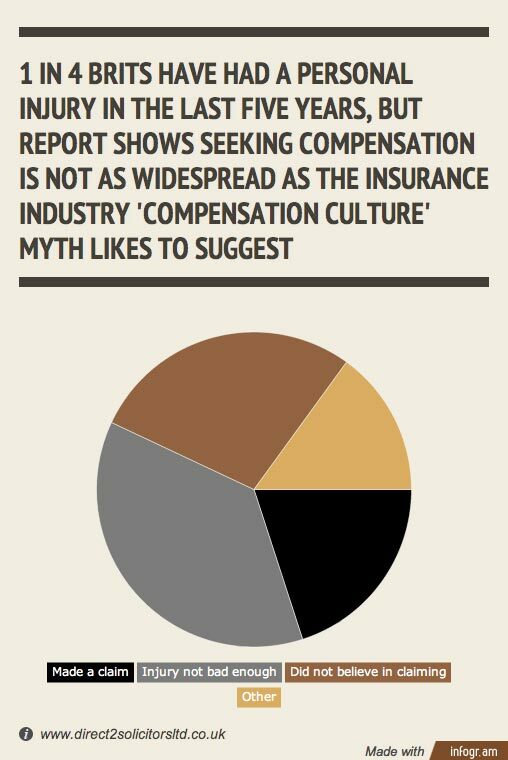 However, those of us who work with and for the injured claimants seeking a fair compensation settlement to cover their injuries and losses would argue that it is those that support the now discredited narrative of the Insurance industry of there being a ‘compensation culture’ who are the greedy ones. It is they who don’t want claimants who legitimately pursue their claims to do so. It is in the interests of the insurers to not want claimants to pursue their legal right in making a claim for compensation. It is sad that they continue with the now discredited compensation culture myth narrative to muddy the waters and cause genuine claimants to worry that they will be tarred with the brush of being a claimant seeking something for nothing and being a part of the culture. The pressure and misleading narrative from the Insurance sector is blatantly happening, but how do we change this view? Without the help of the government – who seem to be in bed with the insurers, it’s hard. As ever, at Direct2Compensation and our colleagues in the wider personal injury compensation sector, we’ll keep on representing decent claimants with our excellent service.